This collection of short essays provides a rigorous, rich, collaborative space in which scholars and practitioners debate the value of different methodological approaches to the study of life narratives and explore a diverse range of interdisciplinary methods. Auto/biography studies has been one of the most vibrant sub-disciplines to emerge in the Humanities and Social Sciences in the past decade, providing significant links between disciplines including Literary Studies, Languages, Linguistics, Digital Humanities, Medical Humanities, Creative Writing, History, Gender Studies, Education, Sociology and Anthropology. The essays in this collection position auto/biography as a key discipline for modelling interdisciplinary approaches to methodology and ask: What original and important thinking can auto/biography studies bring to discussions of methodology for literary studies and beyond? And how does the diversity of methodological interventions in auto/biography studies build a strong and diverse research discipline? 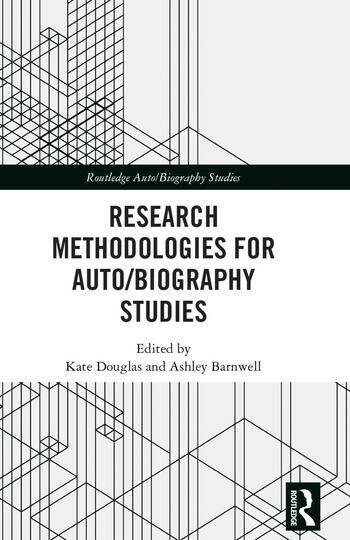 In including some of auto/biography’s leading international scholars alongside emerging scholars, and exploring key subgenres and practices, this collection showcases knowledge about what we do when engaging in auto/biographical research. Research Methodologies for Auto/biography Studies offers a series of case studies that explore the research practices, reflective behaviors, and ethical considerations that inform auto/biographical research. Kate Douglas is an Associate Professor in the College of Humanities, Arts and Social Sciences at Flinders University (South Australia). She is the author of Contesting Childhood: Autobiography, Trauma and Memory (Rutgers, 2010) and the co-author of Life Narratives and Youth Culture: Representation, Agency and Participation (Palgrave, 2016; with Anna Poletti). She is the co-editor (with Laurie McNeill) of Teaching Lives: Contemporary Pedagogies of Life Narratives (Routledge 2017), (with Kylie Cardell) of Trauma Tales: Auto/biographies of Childhood and Youth (Routledge 2014) and (with Gillian Whitlock) Trauma Texts (Routledge, 2009). Ashley Barnwell is the Ashworth Lecturer in Sociology in the School of Social and Political Sciences at the University of Melbourne. Her research focuses on memory, emotion, and family storytelling. Her work has been published in journals such as Life Writing, a/b: Auto/Biography Studies, Memory Studies, Cultural Sociology, and Emotion, Space & Society. She is currently co-authoring a book (with Joseph Cummins), Reckoning with the Past: Family Historiographies in Postcolonial Australian Literature, (Routledge 2018).